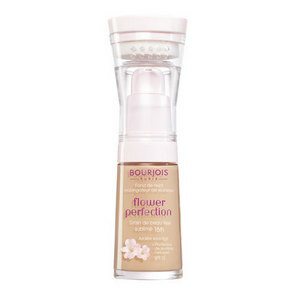 Now as you may know if you read my past blog posts, i love Bourjois Healthy Mix foundation which has been a firm favorite of mine for a few years now but i thought i should branch out a little and give another of there foundation a chance. It contains SPF 15, smells of wild azalea (apparently) and promises to last up to 16 hours with youth cell protection thrown in. I have to say that it doesn't smell as nice as the healthy mix one and it certainly doesn't smell of flowers, i'm not really keen on what it does smell like which is kind of a chemical odor if that makes sense (have a sniff and you'll find out!). As for the texture it boarders on the medium to thick coverage which is lovely as it spread well but i would recommend to use your fingers as the warmth will help it blend in better then a brush because of the consistency (has a sponge on top but that's not really very helpful!). I still use a concealer over the top (another Bourjois product i will be reviewing next) because i have big luggage under my eyes to contend with and a lot of redness around the nose which i'm sure a few layers of foundation could handle but i just prefer a concealer. I have normal to oily skin so come the 6 hour mark of wearing it i do start to get a tad shiny around the t-zone but nothing a little light powdering couldn't handle. It defiantly wouldn't last 16 hours on me though as mainly i don't tend to wear make up for that long but also because i don't believe it could last this long (on me that is, it could be different for others!). It has 5 shades in total which i think most certainly needs expanding as it has nothing for darker ladies and there is no happy medium between No 51 light vanilla and No 52 vanilla which may sound similar but are very different shades. 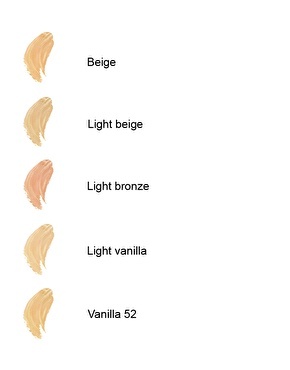 Light vanilla matched with my pale complexion pretty perfectly actually so if your pale i'd head for that shade. Overall it's a nice foundation but i will be going back to the Healthy Mix Foundation right after this is finished with.